Become part of the Puppy Patch Family! Our Guardian Home program allows for local families to have a top quality puppy breeding dog for $500 an 1/8th of the regular the price. The Guardian Home puppy or adult dog is part of the Guardian Home’s family forever, while the breeding rights are retained by Puppy Patch Labradoodles for a short period of time (each situation is slightly different so we prefer to work out specific details with each family on an individual basis). Once the guardian dog has completed his/her breeding career, he/she will be spayed or neutered at our expense, and your guardian dog is then fully turned over to you. The dog will remain a forever pet of their Guardian Home! If you think you may be interested in being a Guardian family please take the time to fill out our owner application and contact me at puppypatchlabradoodles@gmail.com. Thinking of adopting a LABRADOODLE? If you would like one of these wonderful dogs for your family, please take the time to fill out our owner application. 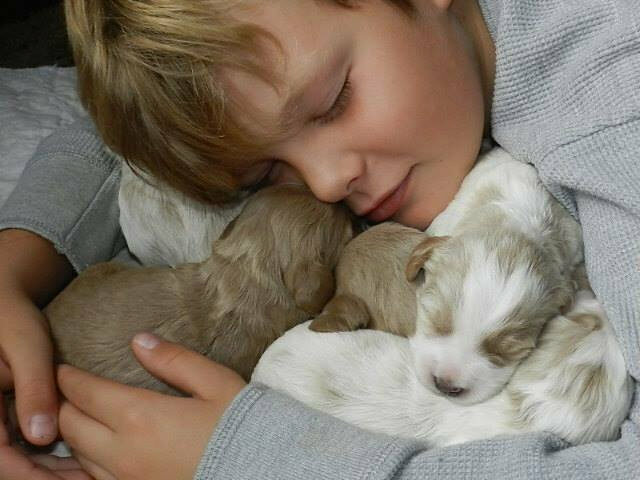 A guardian family gets the very best that Puppy Patch Labradoodles has to offer in the Australian Labradoodle! This means that we choose our breeding stock based on the best qualities that are outlined in our breed standard with temperament of course coming first. Click on the boxes below to learn more about our Guardian Home Program. Yes, initially. We do not give our guardian dogs or pups away. The cost of a Guardian Home dog/puppy is the cost of $500 an 1/8th of the regualr cost. The standard pet price is $2,850 regardless of the age, gender, color, or size of the puppy/ dog. When the Guardian puppy/dog has completed its breeding career for us, we will have the dog spayed and or neutered at our cost. Our guardian home families are responsible for the general routine veterinary care and wellness of the Guardian puppy/dog placed with them. This means annual vaccines, feeding a high quality dog food, grooming, heartworm prevention, flea/tick prevention, training, regular exercise and socialization, and most importantly all the love and care and attention possible! A guardian family gets the very best that Puppy Patch Labradoodles has to offer in the Australian Labradoodle! This means that we choose our breeding stock based on the best qualities that are outlined in our breed standard with temperament of course coming first. Another wonderful benefit to our guardian families is that their guardian dog or puppy will be completely health tested by 12 months of age (some tests may be done as early as 16 weeks of age) at the expense of Puppy Patch Labradoodles prior to entering our breeding program at no cost to the guardian family. Our guardian families get to enjoy the excitement of being a part of our breeding program, and seeing the offspring of their very own guardian dog be placed with families across the country bringing others the same joy and happiness that they have received from their guardian dog! That you live within 90km of our home. That you have physical fencing to provide a safe and secure environment for the Guardian dog/puppy. You must have a schedule that will allow for your dog to not be left alone for extended periods of time. All dogs and pups placed in guardian families must be indoor dogs. Your dog must not ever be unattended while not in a fenced area. Guardian families must have reliable transportation, and a willingness to bring the guardian dog/pup to us when needed throughout the year. As a Guardian Home you must be willing to feed top quality food, and provide your puppy/dog with regular vet care when needed. You must not have any un-neutered dogs in the home living with the Guardian Family. How does the Guardian Home Program work? If you are applying for a young adult, or mature Guardian dog, she will already come to you completely health tested, and may have just a couple more breedings for us (depending on her age and the number of litters she has had) prior to her being spayed and released solely to you as a forever pet. When the Guardian dog is in season, the Guardian Family is required to contact us immediately. An intact female usually has a heat cycle that will last between 14 and 21 days. During this time, we will need access to her for breeding related appointments. Once she has been bred, she will remain with her Guardian Family until one week before her due date. At that time, the Guardian dog will come back to stay with us throughout her pregnancy, and will be returned once her pups are fully weaned approximately 7 weeks later. Guardian Families are welcomed and strongly encouraged to visit with scheduled appointments while their Guardian Dog is at Puppy Patch Labradoodles. If you are applying for a Guardian Home puppy, she will come to you at 8 weeks of age. During the first year, Puppy Patch Labradoodles will have her health testing completed. Once we receive all of the results from her health testing, we are then able to assess whether or not she will enter our breeding program. If for any reason we decide not to breed the Guardian Puppy placed with you (this is a decision solely made by Puppy Patch Labradoodles) we will then pay to spay the Guardian puppy at no cost to you, and she will remain a forever family pet with her Guardian Family. If you are receiving a Guardian Home puppy, we ask for monthly photos and updates during the first year so that we can watch her develop, and update our website. We also will require a visit to our Guardian Family’s home every few months during the first year to assess the Guardian Puppy, as well as build a relationship with her for the future. Occasionally, we will ask our Guardian Families to bring the puppy to us for a visit so that she can get comfortable with our home for when she will be here with us in the future having babies. Each dog is individually assessed before determining their required litters. Most of our Guardian dogs will have between three and four litters for us. Female Guardian puppies placed in a Guardian home will have up to (and no more than) a total of four litters. The health and well being of our breeding dogs is a priority to us, and prior to any breeding, Puppy Patch Labradoodles will receive clearance by our regular veterinarian. Occasionally we may decide to have fewer litters if we have accomplished our goals in development of our Guardian dog in a shorter period of time. Again, this is determined by Puppy Patch Labradoodles. Get some tips from our puppy training page.